Automated (programmable) x,y,z control of all sensor positions with high (mm-scale) accuracy. Integration of multiple sensors measurements (sonar, water surface scanner, laser elevation scanner, photography). 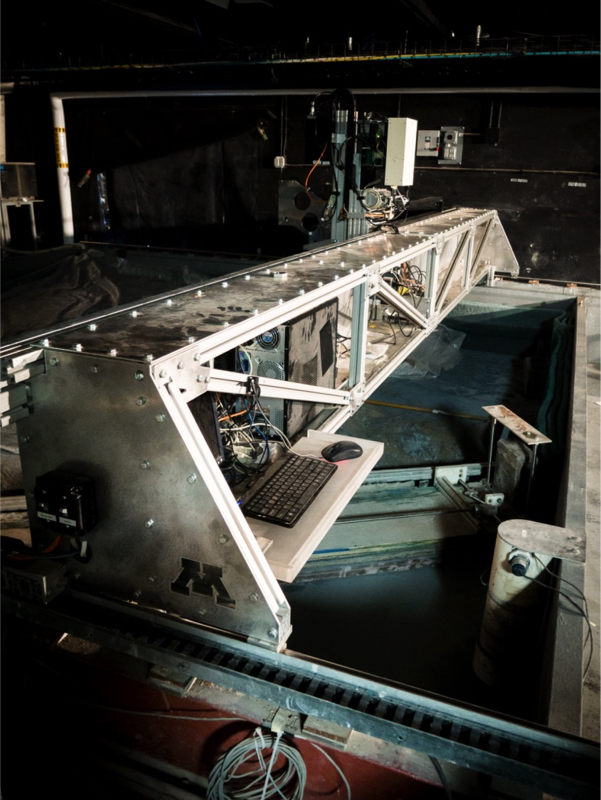 Sensors are attached to a cart that is attached to the top of a flume or tank on rails. Each Data Acquisition Carriage is uniquely designed to the specifications of the flume or tank in which it is used, but all carriages are built on with common mechanical, sensing, and computer components. Sensors attached to the cart can be customized for specific applications. Programming of the Data Aquisition Carriage is determined by Microsoft Excel VBA scripts, and data are outputted in comma-delimited formats. Carts also contain safety features to ensure minimize the risk of injury or equipment damage. See http://www.safl.umn.edu/services/measurements for more information.